Lapland Hotels Oulu offers you a chance to experience Lapland in the heart of a city. The hotel is situated in the centre of Oulu, next to the Cathedral and the historical Ainola park, and its 160 rooms have been decorated with skill and style to suit the taste of even the most quality conscious guests. The design of our rooms was influenced by nature and the stories of Lapland. The party and conference facilities of Ynninkulma bring the atmosphere and the story close to you. Lappish peace or mystique – it’s up to you. Hotel garage: For hotel guests the parking costs 15 € / night when paying to reception. Otherwise paying to Autoheikki it is approximately 20 € / night. Drive straight to Autoheikki, take the entry ticket when driving in and then, come to pay the parking to reception and you will get the exit ticket to Autoheikki from us. Places can not be reserved. There are also three charging spots for e-vehicles in the garage: 2 x Tesla Destination charger and 1 x Tesla Wall charger for all type2 vehicles. 2 x Type2 22kW, 100km/h, 32A Tesla Destination Charger – Tesla only. Parking fee 25 € + charging fee 15 €. 1 x Type2 22kW, 100km/h, 32A Tethered type2 wall charger for all European electric- and hybrid vehicles. Parking fee 25 € + charging fee 15 €. +charging fee for electric vehicles 15€ and for hybrid vehicles free of charge. Late check out costs 10€/hour and is subject to availability. Please contact reception for further information. Sauna and swimming pool available every day 5-9pm. Separate saunas for men and women. We also have some private saunas available. Please contact sales.oulu@laplandhotels.com for availability. Fressi gym is available for our customers, 5€/visit. Gym is free of charge for customers staying in our Deluxe rooms or Suites. Bicycle rental available in summer months, 15€/day. Bicycle rental is free of charge for customers staying in our Deluxe rooms or Suites. Open 24 hours. We have snacks, drinks and souvenirs available. Extra beds available in some rooms, 25€/night. Please contact reception for availability. Baby cots available in all rooms. Please contact reception for availability. Pet rooms available, pet supplement 20€/stay. Please contact reception for availability. Oulu Airport is located in Oulunsalo about 15 kilometres from Oulu city centre. Taxis are on call at the taxi stand in front of the airport during the scheduled arrival times. If you wish to confirm a ride or you have special requests, you can book a taxi before arriving at the airport. It takes about 20 mins to reach Lapland Hotel Oulu from the airport. A regular connection from Oulu Airport to the city centre is operated by Koskilinjat Oy. Other public transport schedules are available on the Journey.fi website. Oulu Railway Station is located near Lapland Oulu Hotel. You can reach the hotel by walking from the railway station for approximately 10 minutes. Exit the railway station from the main building and turn right on to Rautatienkatu. Walk approximately 150 meters and turn left on to Linnankatu. Walk for about 500 meters until Kirkkokatu junction and turn right. The hotel will be right in front of you on the right side. If you need to take a taxi you can find a taxi station just in front of the main entrance of the railway station. Taxi service number is +358 (0) 600 300 81/ Oulu area taxi service. The hotel is located almost in the city center at Kirkkokatu Kirkkokatu 3, FI-90100 Oulu. When arriving via the highway drive towards Oulu city center. Just before the railway station turn right to Ratakatu and continue to the end of Ratakatu. Turn left at the three-way junction to Kajaanintie and continue by under the railway following the Heikinkatu and continue straight despite the main street continuing to the left, follow Heikintie for three blocks and turn left on Kirkkokatu, the hotel will be immediately on the left side on Kirkkokatu. You can park your car temporarily for unloading of baggages in the front of the main entrance. 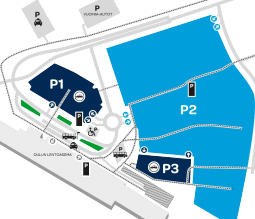 For longer term parking we have parking space available in the park house Autoheikki at Heikinkatu 5. There are some parking spaces available in the vicinity of our hotel where parking is free for several hour periods but where a special parking timer badge is required. More information is available from the reception. Restaurant Oula pays homage to the Northern experience and evokes the atmosphere of Lapland. Lapland Hotels Club is an inner circle for those who enjoy the northern lifestyle. It can bring many benefits and a lot of joy to your visits! It is time to enjoy what nature in Lapland has to offer. We have taken our best ingredients with us and made something pretty tasty out of them. Your well being at the Lapland Hotel Oulu starts with the breakfast. The fresh, clean and rich tastes it offers are available for everyone visiting or living in Oulu. Our breakfast table also offers the famous black sausage from Pirkaanmaa region in the South Finland. But we wanted to take this further and so we developed their black sausage to the next level and offer to our customers an exquisite version made of reindeer meat straight from the ultra clean Lapland wilderness. And, to make your breakfast more interesting our chef will cook you omelettes to your liking and you can choose the filling including smoked reindeer, onion or fresh tomatoes. And we do want to mention also our excellent bread selection, Finnish fish specialities, fresh salads and vegatables, tasty olive oils and refreshing smoothies. Breakfast can also be purchased without having to stay overnight at our hotel. Conference rooms for a total of 500 people; largest hall for 180 people and smallest room for 10 people. Conferences with genuine tastes in Oulu take conference guests to the journey with pure and fresh flavours. Birch sap’s body purifying effects, spruce shoot’s circulation strengthening nutrients as well as Arctic char from fresh Lappish waters or reindeer that have been wandering around untouched bogs are in the main role at the meetings. We in Lapland appreciate every one’s personal way and style to hold meetings. We serve organic snacks to accompany forenoon meetings and at the lunch time you can find flavours from forests and lakes in our menu. Surrounded by genuine tastes you can enjoy your conference with us even longer. Capacity of the entire restaurant for a dinner is 250 persons and for coctail event 600 persons. Ynninkulma is the pride and joy of the new Lapland Hotel Oulu. It is the most atmospheric venue in Oulu for both small and large events. Located next to Franzén park and Oulu Cathedral, the old wooden house of Oulu YMCA “Ynninkulma” still stands as proud as on the year of 1825, when it was built. This old house has gathered a beautiful patina over the years and seen the city grow to 5,000 inhabitants as well as witnessed the city’s role as the governmental capital of the province. The oldest of the three vaults on the grounds was built in the middle of the 17th century, so you can certainly feel the history of Oulu. Now Ynninkulma is something that Lapland Hotel Oulu can be proud of. The banquet room is a part of the most atmospheric Oulu for small and larger events, and the Ynninkulma wine cellar can even offer wine tasting events on order. Lapland Hotel Oulu has 12 well-equipped meeting rooms, and the world of tastes from Restaurant Oula will spice up your events. 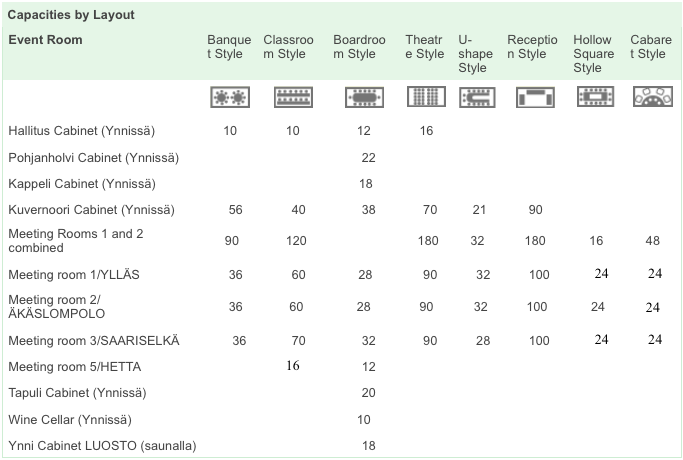 Therefore, you can choose the best part of Oulu. Did you know: The name “Ynninkulma” refers to the four centuries, when OYMCA had their premises on the same spot?